OK, we tend to believe in different things, we may come from different cultural influences, differ in religious beliefs, align with opposing political inclinations, look different, act different, have more or less opportunity, vary in our opportunity for a quality education, and economically differ significantly, but why can’t we just get along. This is, of course, a tongue and cheek question since the answers are in the folds of this prior sentence. There is, however, a commonality that exists between every culture, every religion, and every political climate: we relish our culinary heritage. Of course, it was easy for Pavarotti, who did not suffer from the ability to put food on his table, to state this. There are many people throughout the world who are incapable of providing this basic need for themselves and their families. This is tragic for a number of reasons; obviously we need food to survive, but almost as important, we need certain foods to help preserve our heritage and define whom we are. It is, from my perspective, this heritage that can help to bring us together and “Get along”. My experience has demonstrated that people are proud of their heritage, in particular their food history, proud of those who intend to preserve this heritage through cooking, and passionate about professional cooks and chefs who dedicate their lives to this endeavor. I have had the pleasure of meeting, and in some cases, working with professional cooks from various parts of the world and I can state, unequivocally, that our common appreciation for food is a bond that supersedes any differences that we might have. Those who are open to appreciating another person’s culture, in this case cuisine, will almost always find a seat at the table, a smile, and a full glass of the local beverage. Breaking bread is the great equalizer. I have know chefs who worked in the White House – responsible for State Dinners that brought friends and adversaries together over a plate of food. I worked with the Executive Chef for the United Nations and marveled at his appreciation for, knowledge of, and subsequent stories of the foods from every cultural representative who sat around the Security Council. I have marveled at the brother and sisterhood that exist among chefs who compete in international culinary competitions, and those who dedicate their time and expertise to feed the homeless and the needy have humbled me. It is the plate of food and the effort that is applied towards its preparation that pushes our differences aside and creates a common ground to learn how much we are the same. We should all applaud those cooks and chefs who are dedicated to understanding and preserving cultural cooking techniques and flavors; those who are focused on bringing us into the homes and restaurants of people from around the world – places that we don’t know and places where we have a tendency to pre-judge because of our ignorance; and those who dedicate their time to creating opportunities for chefs to get together and talk about food and it’s impact on the world. Praise should be given to Anthony Bourdain for his commitment to opening doors and kitchens to each of us. His documentary approach towards learning about people who we don’t understand, to the culture that they are so proud of, and to the food that inspires this pride – should be an essential part of any balanced education. Praise should be given to Chef Charles Carroll, president of the World Association of Chefs’ Societies (WACS) – an organization of 100 country chefs’ associations, representing more than 10 million professional chefs worldwide; and numerous organizations and programs dedicated to feeding the less fortunate and bringing sustainable food programs to countries in need. “The World Association of Chefs’ Societies (Worldchefs) is a non-political professional organization, dedicated to maintaining and improving the culinary standards of global cuisines. When we feed the people of the world, when we show respect for the history of their food and food preparation, when we lift a spoon in recognition of their technique, break bread and toast their culinary history, we begin the process of setting aside our differences and looking for that common thread that might allow us all to “Get along”. Knowing that every cook may not have the ability to impact this global appreciation, there is much that can be done in your micro kitchen world. Dedicating yourself to learning about the roots of cuisine and showing respect for authenticity is a start. To a person of a different culture – failure to take the time to learn the how and why of their food process and flavors is insulting. Your job as a cook should go way beyond following steps, organizing your station, and replicating the plate presentation that emulates the chef’s style. Your job, for those who are serious about what they do, is to reflect knowledge and appreciation through each plate that is prepared. A chef’s job is to be caretaker of these processes, become the teacher (not just the trainer), encourage and in some cases – insist that cooks work from a basis of true understanding and appreciation, and be the vehicle for demonstrating how food is the great unifier. This may seem very altruistic, but it is a small way (maybe a big way) with which we (cooks) can make a difference. Consider what we do as being more than a job or a career – it is what we are meant to do. If this is the case then we owe it to ourselves to leave a positive mark. 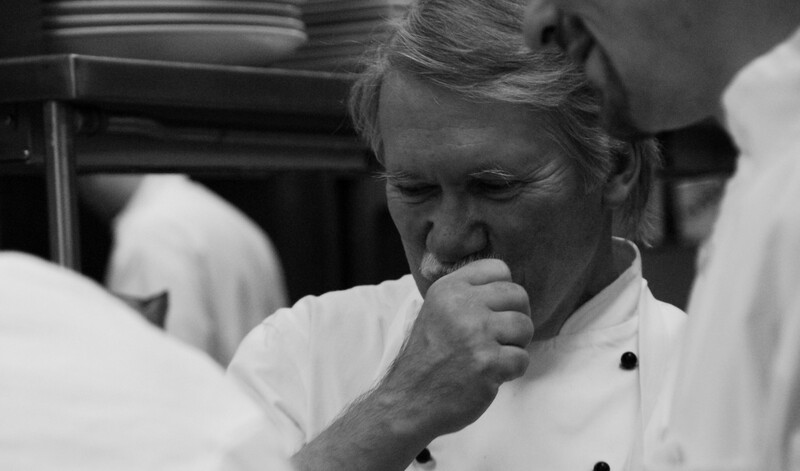 Cooks and Chefs – What we do is enormously important.